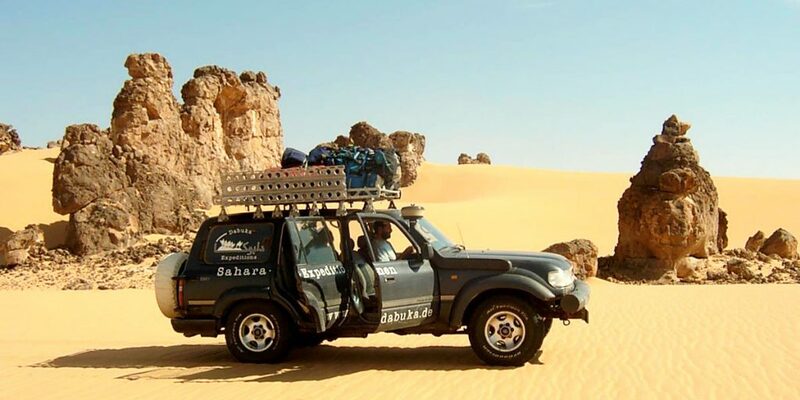 Dabuka was officially established in 1996 but has been conducting desert expeditions since 1983. We show you the land and its people in a very special way, far from the usual tourist tracks. We take you on exciting adventure tours, a unique desert experience where we introduce you to huge sand dunes, tranquil wadis and untrodden paths. Our specialization is the challenging trip to the Gilf Kebir Plateau and the Great Sand Sea in south-west Egypt. Some of our special trips in recent years have been expeditions for German-Egyptian scientific projects in the Great Sand Sea and one in 1997 for students from the “Freie Universität Berlin”. A logistical highlight of our expeditions was surely the transportation of a dismantled ultra-light plane in a Toyota Landcruiser into the Great Sand Sea as far as Wadi Abdel Malik in 1999. It was assembled there and used for aerial shots in the documentary film “Schwimmer in der Wüste” (Swimmer in the desert). Since 1997 our standard tours have also included important Roman and Greek ruins along the coast in expeditions into the Libyan desert. Our first pilot expedition into Sudan took place in 2003. Founder and owner of DABUKA since 1996. A German-Egyptian dentist with over 200.000 km of desert travel experience. Organizer and leader of the expeditions. Under German management, it is responsible for planning and administration of the tours on site. With long experience in coordinating and guiding and leading the tours, as well as a fondness for cooking and mechanical knowledge to care for the desert vehicles. With Romance and Germanic languages and a nomad at heart, is responsible for overall coordination in Egypt. Manages the office in Gauting. A German-Egyptian, guide and one of the most knowledgeable people in the desert. Scientific tour guide and manager of our website. An archaeologist specializing in Sudan and Egypt, and also a computer science specialist, organizer and coordinator for Sudan, Ethiopia, and Djibouti. From Bad Honnef. Crossed the Sahara in 1980 and is a passionate geologist specializing in the Sahara, from Mauretania to Algeria (which is his favorite) through Libya and Egypt. Almost every year he makes a trip with ” his camels”. Our fleet consists of Toyota Land Cruisers HJ 60/80 and 76, and Hilux. They are all four-doors with forward-facing seats. All our vehicles are equipped with separate reserve fuel tanks and heavy duty springs. All vehicles also carry sand mats. We are well equipped with maps and use GPS for navigation. Along with radio communication, we can ensure the safety of all our expeditions. Our camping equipment includes a complete kitchen to provide for the well-being and culinary satisfaction of our guests.